The fall winter collection of Dolce and Gabbana intrigues me, the blend of androgyonus style and stardust attack is like no other. 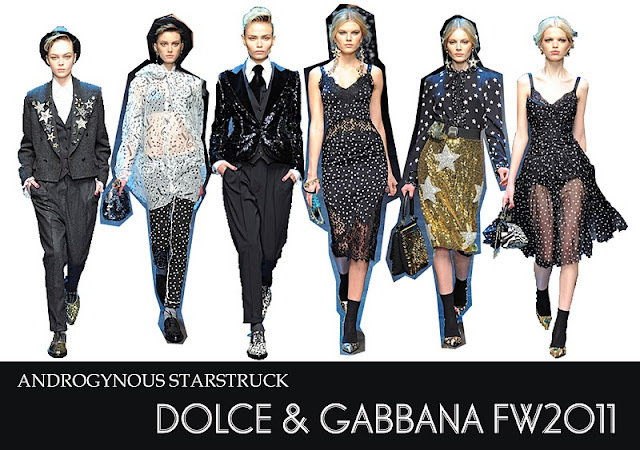 At first, when we think abot it, star prints may look tacky, but the fashion house show us how to pull them off. I found this skirt on thrifted store while I acompanied my friend, we passed by Woman Council in Bras Basah and they are having kind of bazaar. I saw this star printed piece at a glance and it still has a new tag on it, but that day i scored it with only sgd$ 1.5 yes 1 point 5, my cheapest buy so far, i couldn't be more happier. pair it with black blazer and a pair of loafers for androgyny hint. Massimo Dutti top. unbranded black blazer. thrifted skirt. Mitju loafers. Zara large clutch. Dior Addict lipstick. As a start, choose a neutral colour piece and smaller prints. When you get used to it, get bigger prints. Try them off, it should be fun! I love androgynous style. DG is awesomeee loving those looks. lovely outfit!! and i love the background in your pics. my dear friend, you look so great, love your cool skirt! What a great skirt - and such a bargain too! I do love the star print, although I can't believe it's already making a comback (didn't we have this a few seasons ago already?). amazing shirt and the skirt is great! :) it's very original!! you look supercute! perfect black and white,love your pretty shoes,skirt. cute fhennnn <3!! RE Singapore : Actually I'm working there then I go back to Jakarta. such a wonderful outfit! love the skirt and the price for it. Stunning Indie Clothing Styles collection! visit me blog! im a newbie..
Love ur outfits and u look so gorgeous ! !